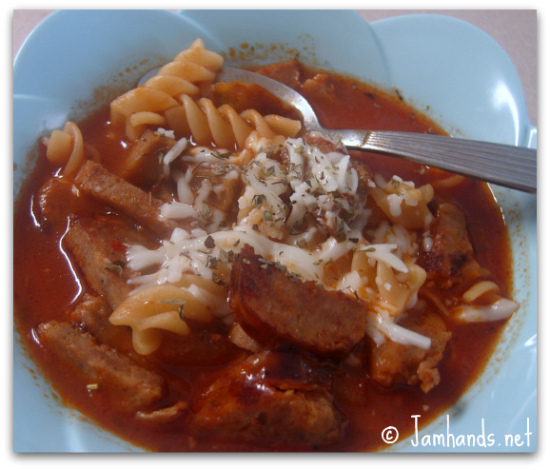 This delicious and comforting recipe for Lasagna Soup comes from a great website, $5 Dinners. Many thanks to Erin for a tasty and economical dinner recipe. You can find many more on her website. Serve with cheesy garlic bread and a green salad. My notes: I omitted the bay leaves since I didn't have any on hand. I also used a mix of Italian herbs as a substitute for the oregano and basil. 1. In a large pot, heat olive oil to medium heat and saute onions until golden. Add garlic and let cook for 1 minute, then add meat. Cook the meat until done and drain any fat. 2. Add the spices, spaghetti sauce, chicken stock and bay leaves. Simmer for about 15 to 20 minutes. Add pasta and increase heat to bring to a boil and cook for recommended time directed on the pasta box for al dente. 3. Discard bay leaves and add any salt and pepper needed. Stir in fresh parsley and serve with shredded mozzarella cheese on top.